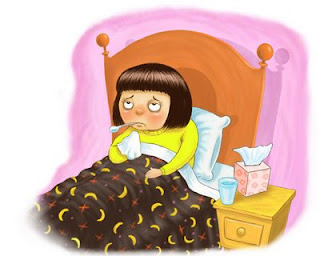 It's Aida4eva: Can I Exercise When I'm Sick? Can I Exercise When I'm Sick? The rule of thumb for exercising while sick is called the above/below-the-neck rule. If your symptoms appear above the neck (runny nose, sneezing, sore throat), then yes, you can continue with a low-intensity workout. Studies have shown that exercising at a moderate-intensity level does not intensify cold symptoms or compromise the immune system. Avoid high-intensity exercise, such as heavy weight lifting and high-intensity aerobic training, which has been shown to have a negative impact on the immune system during a cold or any respiratory infection.